You only exit your business once! It’s often the single, most important financial decision that you’ll ever make for your business and your family’s financial future. In today’s video, I’m bringing it all together and giving you a much better idea of how this process works. The key elements of a successful exit from your business. Where to begin this process – it’s quick, easy and it’s free! When I started True North with my dad, I was incredibly excited. We had worked at big firms together for 10 years and for the first time he and I were going to become entrepreneurs and business owners. It’s sort of this train that leaves the station and that train is not going to stop for a variety of reasons. I think for a lot of entrepreneurs, you have highs and you have lows. If you’re a successful entrepreneur, going back to the train, you know how to get the train out of the station. It starts moving along the tracks and it gains some steam and it moves along and pretty soon it’s like this runaway train. But we don’t know how to get off the train and that’s scary. The exit planning process really addresses when we have a successful business and it’s a high speed train that might be a runaway train. Now we want to get off. What do we need to do? What are the steps we need to take to get off the train? I’ve spent the last couple of months talking about each of the stages of the exit planning process and today we’re going to bring it all together. I’m going to talk about the process as a whole and how all these pieces fit together. 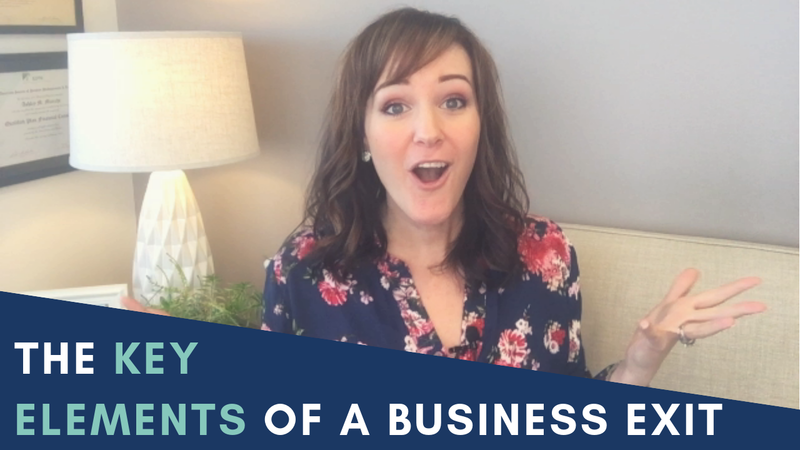 I’ve discussed: how to value your business, establishing your timeline and your goals, discovering your gap, creating the exit plan, and then closing the gap and preparing to exit. This is where we create the plan and then we put the plan into action. That’s the overview of the entire process. And depending on who you’re selling your business to, this could take years, it could take months. Ideally you would start planning for the exit of your business about 5 to 10 years prior to when you want to fully transition out. One of the things that’s a little different about our process at True North, is that we value the business first. I’ve explained this numerous times in previous videos about why this is so important. Basically, the valuation kind of functions as your starting point on your GPS. If I want to go somewhere from where I am and I want turn by turn directions, I have to tell my GPS where I’m starting from, what’s my starting location. That’s what business valuation does. We have to know what the business is worth today because it influences so many other things that we do down the road. One of the reasons why most business owners do not know what their business is worth, is because of a lot of misconceptions and myths. It’s expensive, it’s time consuming and it’s disruptive to the business. If you go back to previous videos, I showed you that with 8 pieces of information, you can value your business and get a very good ballpark estimate of value in 5 minutes. We develop a timeline and objectives for the exit. This involves: How much longer do you want to be involved in the business? Who is best suited to take over after you exit? Are there family considerations? We really to understand your drive for what your timeline looks like, what your goals are, who you want to take over, and then what you want the business to look like after you exit. Most business owners, they want to see their business continue. They don’t want to just shut the doors and leave and close up one day. Whoever they choose as their successor, they want that person to be successful. We don’t want to set them up for failure. This is where the real deep work begins. We have to take all those goals, all those objectives, all of the business value and the personal assets and bring that all together in to the actual plan. What are we going to do to ensure a successful exit? When are we going to do it? What things can we sort of discard and set aside? And what things do we need to focus on? Do we need to set up a non-qualified deferred compensation plan? Do we need to review employment agreements or non-competes? There’s tax considerations – tax considerations are huge! The exit plan, the actual living breathing document of the exit plan, addresses all of these elements and then it prioritizes them. I’ll leave you with this. Back in 2009, my husband and I bought our first house and it was a stretch for us financially to buy a house. We were pretty young and when it came time to clean our gutters that fall, we decided instead of hiring someone, we were going to do it ourselves. My husband bends over to move this planter out of the way so we can put the ladder there and get back up on the ladder to keep cleaning the gutters. He’s doing this and throws out his back. I do what any caring, loving wife would do. I let him lay there while I got up on the ladder and finish cleaning the gutters. What’s the moral of the story? Sometimes you need to hire an expert. Had we hired an expert to clean our gutters, my husband wouldn’t have thrown out his back and I wouldn’t have been an uncaring wife who just went about her business cleaning the rest of the gutters. He ended up sitting on the couch mostly for a couple of weeks and was in agonizing pain for several weeks and it was just a real bad situation. All because we wanted to save a little bit of money and not hire someone to clean out our gutters for us. What’s my point? My point is that you only exit your business once. It’s the most important business deal that you’ll ever make and it has ramifications for 20, 30+ years. I don’t care if you hire me or you hire somebody else, don’t do this alone. Hire somebody who’s experienced, who understands how to guide business owners through the exit of their business successfully. The first step is really understanding what your business is worth. What we’ve done is we’ve made a free tool available to you with eight pieces of information. In five minutes, you can find out what your business is worth. Just go to >>truenorthra.com/valuemybusiness. You will get your free checklist access and unlimited lifetime access to the valuation tool. Whether you do your valuation today or if you want to update it in a year or two years when your business changes, we have to update your valuation. It’s free with no strings attached. Did this answer your questions? Did you find it valuable? Please subscribe to our newsletter below to receive future updates in your inbox! BUSINESS EXIT STRATEGY: HOW MUCH DO I NEED TO RETIRE?